He was due December 10th, but my wife woke me up at 4 AM on November 29th: her water had broke. The online birth date probability calculator I'd found (and recreated in Tableau) had only listed a 25% chance the baby would be born this early, and while I'd love to say we were completely prepared, it'd probably be more accurate to say we were 25% prepared. However, our birthing class (of which we had one of four classes remaining) provided us clear instructions, so we called the doctor, packed our bags, and drove to the hospital. Now, it's important to note that we'd had our last obstetrics appointment just 12 days prior, and everything had looked fine. Our doctor had repeatedly referred to our pregnancy as "picture perfect". However, when we got to the hospital, we found out that picture had dramatically changed - and the scary data began. First off, there's quite a few things happening here. While this is a post on data viz, I'm not going to critique the chart design, for 2 reasons: first, it worked - everyone interpreted this chart quickly and efficiently; and second, there's a better story here to tell. There are two charts here, and we'll start with the one on the top. This measures heart rates - that of the mother (the white line), and that of the fetus (the yellow line). The two red lines represent a sort of control chart - a relatively healthy range for the baby. The bottom chart measures the contractions. As contractions become more and more intense, pressure increases on the mercury in a measuring device, causing the line to spike. Of course, the point is to read both charts together - so, on the left hand side, you can see a contraction at the bottom, and the effect on the heart rates above (don't worry, you're pretty safe assuming a causal relationship here). So, mom's heart rate increased during the contraction (who'da thought, right? ), but also notice that the fetus' heart rate decreased. Notice on the right hand side - there's a contraction, and then a fairly severe dip in the fetal heart rate. Now, seeing this once isn't necessarily a problem, but it became a problem as the pattern started to follow every contraction. This was putting an undue stress on the fetus, as it represented a decrease in oxygen to the baby. It's hard to know exactly why this was happening, but the hypothesis was that somehow the umbilical cord was restricted, and the contractions put on pressure and decreased the flow in the umbilical cord. Regardless of the cause, after several hours of trying multiple positions to relieve that pressure, the medical team recommended a c-section. For better or worse, I was allowed to attend the operation, and even look behind the curtain. As someone who's personally been in multiple life or death medical situations, I've never been so scared in my life. There was the agonizing wait in the OR waiting room while they prepared, and then standing at my wife's head, holding her hand, while on the other side of a too-thin and too-short curtain my wife was literally cut open - all of it was more than overwhelming. But after what simultaneously seemed like forever and just a few minutes, the nurses asked me to stand so I could see the baby delivered - and there he was. A screaming little blue alien that was at least 98% wide, screaming mouth. The nurse called me over to the baby prep station where she weighed him, gave him a diaper, and swaddled him, telling me to take photos (because I was basically a computer program at that point, just responding to commands and not really thinking for myself). She then handed me the baby, and said "he was born very small, which means he's going to have trouble regulating his temperature and his sugar levels..." That didn't really sink in at the time, and she just said, "go take him to mom." Again, I complied. If it seems like the birth events were the climax of this story, and that we wrapped up with a nice resolution, you feel the way we did. But the problem is that the actual birth was just act one of the scary story. While we were enjoying the bliss and exhaustion of an hours-old newborn, we were getting signs of a new, impending conflict in Soren's story. Nurses were frequently checking his sugar levels and temperature - both of which were coming in low, which is exactly what I was told in the OR. Infant sugar levels should be higher than 45, and Soren was coming in consistently in around 40. And his temperature was a degree or so (in Fahrenheit) below expectations - indications that he was struggling. These two things are related in that newborns burn sugar to stay warm. So, he was using too much sugar to keep his temperature up, but since he didn't have the reserves of a stronger child, his sugar was dipping too low, and consequently he didn't have the resources to regulate his temperature. But, this was to be expected when your newborn is less than 5 lbs, and there were some fairly easy resolutions: first, donor milk supplementation to help him get more nutrients than a new mom can provide. Second, he was either swaddled tight or directly placed skin to skin with mom or myself - there was no holding in a onesie except for diaper changes. This was all manageable. We really weren't too concerned - after all, this could all be attributed to his small size, and if you've met me, I'm quite a few deviations south of a Schwarzenegger build. But then drama struck. I'd finally convinced Bekah to get some sleep to recover from her c-section, so we sent the baby to the nursery for a couple of hours. While I was entertaining the in-laws, a nurse asked to speak to me in private. And then she asked me to follow her into the nursery - a place that we were strictly not allowed to be, so I knew something was wrong. I went inside to to find a crew of people surrounding my baby. A physician holding an O2 mask introduced himself, and told me that one of the nurses had looked over to find that Soren had turned blue. They hooked him up to a pulse oximeter to find that his O2 was at 60% and decreasing. They had resolved this baby giving him "blow-by" oxygen, meaning they didn't put an oxygen mask on him, but held it near his face. The physician worked delicately to keep from alarming me, and said he was "not worried, but he was concerned." He also said that they follow a sort of 3 strike rule - and after the sugar, and the temperature, this was his third strike - before they send newborns to the Natal Intensive Care Unit (NICU). This, he said, was simply to help my son get to a more solid starting point, something more on par with most newborns. So, they carted my newborn son to a different floor. This wasn't his monitor, just a screenshot from Google. You're seeing four major data points here: in green at the top, his heart rate; in blue, the oxygen (95 in the image above) and pulse (171); and in white, respiration. All of these came with alarm sounds every time a number dipped below a threshold. Especially of concern was the oxygen, where the threshold was 90. Of course, that was just another stream of potentially scary data. Numbers that would drop, and rise, and drop. Alarms that would ring, and ring, and ring. It turns out, most of these were false positives, often because Soren was quite squirmy and wriggled out of all his wiring. Nonetheless, I was mesmerized by that screen and all the data I was getting. 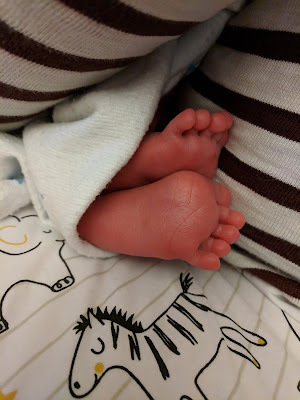 Soren started losing weight, which I knew was normal - but the problem is that when your kid is in the NICU, normal stuff can be interpreted as scary stuff. He went from 4 lbs 6 oz, to 4 lbs 4 oz, to 4 lbs 1 oz. In the end, he lost a total of 5.1% of his birth weight. I had to continually reassure myself that normal babies will lose up to 10%, but mental reassurance only goes so far. But the amazing staff at the Children's Hospital NICU floor within the OhioHealth Grant hospital were incredible. We had one more breathing issue on his second day, where his oxygen dipped and he started turning blue - but it was during feeding, and we sat him up and he pinked up. While the incident kept the physician concerned, he was optimistic that the situation resolved itself so easily. Slowly, Soren turned a corner with little milestones. He started gaining weight again after four days; then, he was taken off the incubator because he was regulating his temperature; and finally, his feeding regimen switched made supplementation optional, by his demand. We were finally discharged after just 7 days, and we took our new son home. As of 2 days ago, at 17 days old, Soren surpassed 5 lbs, and he's grown 2 inches. He passed his birth weight 4 days earlier than most newborns - probably because he's keeping mom and dad up all night eating on a crazy schedule. We keep him in a swaddle, but his temperature is coming out fine. From nurse visits and our appointments with his pediatrician, he's a healthy (but small) newborn boy. Of course, this still isn't the final climax of this story - we've just finished another act, and we're headed into new acts with new conflicts and new climaxes. It may not be more medical issues - we could be headed toward more typical conflicts: learning to talk, potty training, his first exams, his first sports competitions, his first love, and, eventually, perhaps, the act of the birth of his child. There's a lifetime of possible stories Soren could experience, and I'm excited to see which of those will be his to tell. And there's going to be tons more data along the way, and one thing is for sure: as the newest member of the #datafram, Soren's going to grow up learning a lot of ways to tell his data stories.